The middle child in the Lochan family, Neha has taken on a wide variety of duties and she is exploring several developments for Lochan Tea. 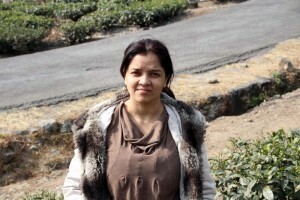 Born in Darjeeling and educated there, Neha has literally grown up with tea all around her. She is using this to her advantage now to follow in her father’s footsteps to bring the story of tea to a wider audience with more emphasis on the history of tea and to teach those in India about teas in China as well. On the Doke Tea Farm itself Neha is exploring making new handmade teas for the tea connoisseur. She is especially interested in making a smoked tea and a yellow tea. Doke Tea has already produced Doke Diamond Green, Doke Silver Needle and Doke Rolling Thunder Oolong. Also on the home front, Neha spends much of her time in more humanitarian efforts to organize much needed schooling for the children on the estate. Her plans are also to start an NGO called Siliguri, The Glory of India, which will help the children in the foothill areas to get an education more easily and to better their day to day living. With the energy of youth and the insight of having grown up in this area, we can expect to see more exciting news from her.